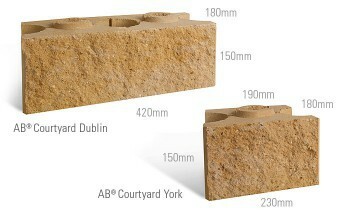 AB® Courtyard is a unique, DIY, freestanding wall system which allows you to construct custom creations in your home! Build patio walls, front fences, fire pits, entrance monuments, bench seats and much more! Your home improvement project is only limited by your imagination. With AB® Courtyard you are able to build freestanding walls to 750mm high and piers to 900mm high plus caps and soil retaining walls and garden beds up to 300mm in height.